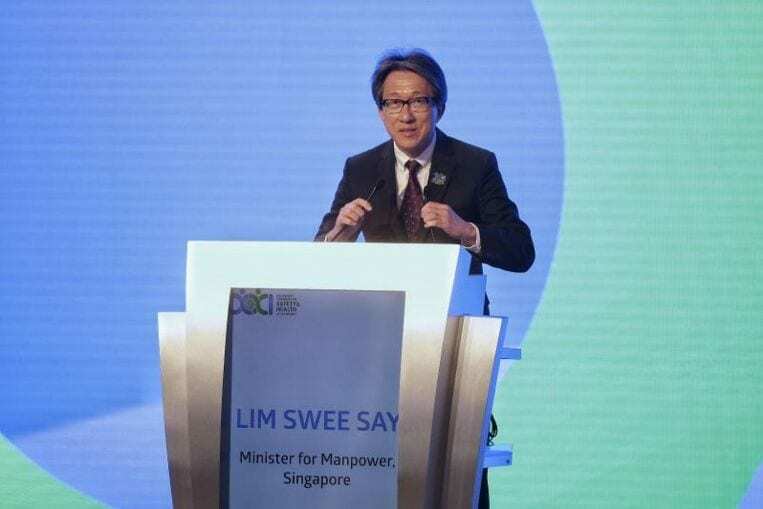 SINGAPORE – Countries worldwide need to step up efforts to fight the scourge of workplace deaths and injuries, said Manpower Minister Lim Swee Say. In a speech on Wednesday (Sept 6) to close a global forum on workplace safety and health, Mr Lim outlined the approach countries can take to prevent accidents and reduce fatalities at work. Each country has to do more, he said, citing how Singapore plans to reduce its current workplace fatality rate of 1.9 deaths per 100,000 workers to below 1.0 deaths before 2028. He expressed the hope that many countries will steadily reduce fatality rates from work accidents over the next decade, to less than one death per 100,000 workers. At the regional level, countries have to learn from each other and work together, Mr Lim said. He noted that Asean countries have committed to raise the profile of occupational health and safety. Labour ministers from the regional bloc signed a joint statement on Sunday pledging to improve workplace safety for workers in the region. “As a member of Asean, Singapore will continue to contribute to regional efforts to enhance occupational safety and health (OSH) capabilities in areas such as training of OSH inspectors, building companies’ expertise in risk management, and accreditation frameworks for OSH training providers,” he said. Third, a mindset of safety and accident prevention should be embedded in youth to sustain this mission globally. Mr Lim said Singapore is doing so by integrating training on workplace safety into curriculum for tertiary students. “Even though concerted efforts to OSH have raised awareness, strengthened capabilities and forged partnerships, much more still needs to be done,” he added. About 3,500 delegates from more than 100 countries are in Singapore for the 21st World Congress on Safety and Health at Work, which ran from Sunday to Wednesday. The Congress, which takes place every three years, is being held in Southeast Asia for the first time. Mr Lim also noted that globally, fatalities have dropped from 13.8 deaths per 100,000 workers in 2003, to 11.3 in 2014. But in absolute numbers, the number of deaths has gone up because the workforce has grown – 358,000 workers died in 2003, and this increased to 380,000 in 2014. Because only by doing so can countries reverse the trend of such injuries and diseases, and the reduce the number of workers affected, he added. Closing off his speech, Mr Lim handed over the reins of the Congress to Canada, which will host the global forum next.